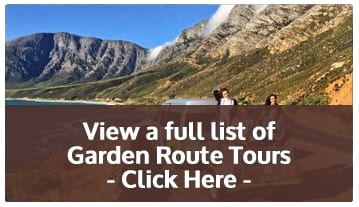 The tour is a fascinating combination of wilderness, wildlife, wine tasting and walking through Nature’s finest gardens. Depart from Cape Town/Stellenbosch early Monday morning for Hermanus. Guests booked for a shark cage dive in Hermanus leave very early Monday morning and miss the first half of the tour to Betty’s Bay. Follow the scenic coastal route stopping at Betty’s Bay to view a colony of endangered African penguins. Afternoon spent exploring the seaside resort town of Hermanus which is famous for sightings of Southern Right Whales during the whale season (July to November), stunning beachside restaurants and a delightful street market. Guests can book a whale watching boat trip in season for an additional charge. Afternoon drive to Cape Agulhas, the southern tip of Africa. Visit a viewpoint known as the ‘actual’ meeting point of the Indian and Atlantic oceans. Overnight in Cape Agulhas or Struisbaai. Dinner included in the tour price. Enjoy a leisurely breakfast before departing to Oudtshoorn in the Little Karoo which is known as the ostrich capital of the world. Route 62 is South Africa’s longest wine route and an iconic feature on the country’s tourist map. Enjoy a delicious lunch and wine tasting at a premier wine farm along Route 62 before joining a guided adventure tour of the Cango Caves in Oudtshoorn. After breakfast, your tour guide takes you over the majestic Outeniqua Mountain pass to Wilderness National Park. Spend the morning paddling on a canoe up Touw River which is flanked by a beautiful indigenous forest. Birdlife is abundant, and scenery is spectacular. Forty minutes up the Touw River, jump out your canoe and enjoy a 2-kilometre hike along a forest boardwalk which takes you to a wonderful waterfall and rock pools. Tour continues via the stunning Lake District of the Garden Route to the famous seaside town of Knysna. This bustling tourist destination in South Africa has an excellent selection of restaurants and shops in a stunning waterfront complex. Relax, shop, eat and enjoy premier wines from the Cape Winelands. After a leisurely breakfast, depart for the world-renowned Tsitsikamma National Park. Stop off enroute at Bloukrans Bridge to watch brave tourists leave off the world’s highest bungee jump bridge (216 meters) and have a go yourself if you’re courageous enough. Late morning is spent in Tsitsikamma National Park which is a fascinating combination of dense indigenous forest and lush coastal vegetation. There is a wide choice of activities available ranging from hiking, swimming in natural rock pools or a coastal bay and crossing an impressive suspension bridge. Leave early evening for a scenic drive along The Garden Route to Addo Elephant National Park where you will overnight at Avoca River Cabins. Spend the morning on a safari tour of the Addo Elephant National Park; up to 3 hours exploring 28 000 hectares of national reserve with 600 elephants as well as Cape buffalo and black rhino and abundance of antelope and other wildlife. Optional: 3-hour drive in open safari vehicle in Addo Elephant National Park with a professional game range. Price available on request. After an exciting safari tour of Addo Elephant National Park, your tour guide drives you to Port Elizabeth. Drop off at approximately 1-2pm. You can add on as many days as you would like at a private game reserve in the Eastern Cape, with round-trip transport from Port Elizabeth at the end of your 5-day tour. Please enquire for rates and options. * Please note that any tour or safari booked through Viva Safaris do not qualify for any discounts or specials.